The WPU Artist in Residency Program provides access to our unique facility for the production of sculpture, installation, performance, 2D and 3D imaging, interactive media, augmented reality and others. Novel, innovative use of the facility is encouraged and theoretical conceptual projects welcome. This residency is designed to take advantage of our facility and the Lab at the Center for Computer Art and Animation. The Lab includes a robot, a Computer Numerical Control Mill, 2 rapid prototyping machines, a 3D Scanner, and a full digital computer lab with multiple softwares and 2D printers available. This residency is directed to a self-starting digital savant who can adopt and adapt to the available technologies. Limited production support is available (carried out by graduate assistants or undergraduate student interns). Work produced during the residency will be exhibited in a solo exhibition at the University Galleries. The exhibition, titled Float: New Work by Maria Lux, features a large-scale installation with accompanying video created while Lux was the fall 2014 William Paterson Artist-in-Residence. Lux used the Computer Numerical Control Mill in the University’s Center for New Art to create a life-size parade float. The machine, linked through software, produces a set of drill tip motions, allowing the artist to create three-dimensional objects out of Styrofoam. The subject matter of the sculpture combines historical references to the Tournament of Roses Parade in Pasadena, California, and tales about raising and transporting sheep in North Atlantic island communities. In addition to the life-size float, Lux created a miniature version of her piece using a 3D printer. This replica is the centerpiece of a stop-motion animation, which presents fictitious television coverage of the 2068 Tournament of Roses Parade. Gallery visitors will have the opportunity to see the float up close as well as in its imagined context. A catalogue of the exhibition includes a foreword by gallery director Kristen Evangelista, an essay by Ron Broglio, images of the artwork, video stills, and Lux’s biography. The catalogue, designed by Thomas G. Uhlein, William Paterson University professor of art, will be available during the exhibition. Copies of the catalogue can also be requested free of charge. Lux received her B.F.A. in art and design from Iowa State University, and earned her M.F.A. from the University of Illinois, Urbana-Champaign. She has shown her work in a number of solo and two-person exhibitions including: Rat Party City,Visual Art Exchange in Raleigh, NC (2014); Animal/Artifact, with David Ross Harper, Dittmar Memorial Gallery, Northwestern University, Chicago, IL (2013); and Ten to Watch, Figure One Gallery, Champaign, IL (2010). She has participated in many group exhibitions such as: Hunter/Gatherer, University Art Gallery, Truman State University, Kirksville, MO (2014); Ecovisions, McLean Arts Center, Bloomington, IL (2014); PostNatural, Isis Gallery, Notre Dame University, South Bend, IN (2013); and A Live Animal, Root Division, San Francisco, CA (2011). She has previously been an artist-in-residence at the Prairie Center of the Arts in Peoria, IL, and at Figure One in Champaign, IL. She has received several awards and grants, including the Illinois Arts Council Artist Project Grant, a City of Urbana Arts Grant, and a Creative and Performing Arts Materials Fellowship from the University of Illinois. 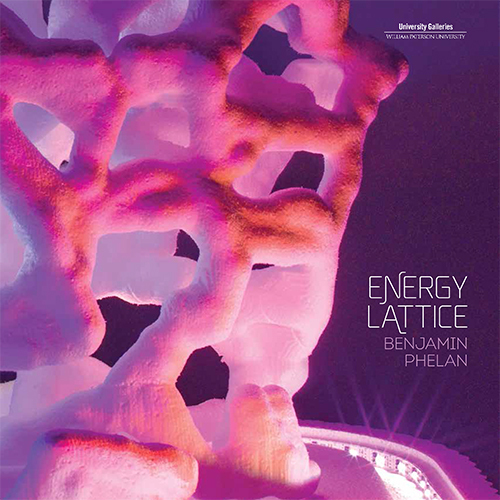 The exhibition, titled Energy Lattice: Benjamin Phelan, features 17 works created while Phelan was the spring 2013 William Paterson Artist-in-Residence. Phelan, who previously used a hand-held wire cutter to carve Styrofoam into human-sized, otherworldly sculptures, used the Computer Numerical Control Mill in the University’s Center for New Art to investigate how his individual hand motions could be recorded in computer modeling systems and then solidified into physical Styrofoam objects. The machine, linked through software, produces a set of drill tip motions, allowing the artist to create three-dimensional objects out of Styrofoam. A catalog of the exhibition, including the foreword by Evangelista, an essay by Brian Droitcour, an interview with the artist by Michael Rees, William Paterson University professor of art and director of the Center for New Art, images of the artwork, an exhibition checklist, and Phelan’s biography, was produced with a grant from the Elizabeth Firestone Graham Foundation. The catalog was designed by Tom Uhlein, William Paterson University professor of art, and edited by Regina Pappalardo, William Paterson University assistant professor of communication. Phelan received his B.F.A. from the Rhode Island School of Design in 2006. He had a solo exhibition at Primetime in Brooklyn, NY in 2012, and has participated in a number of group exhibitions including: W/––– Editions 02 Launch, Eli Ping, New York, NY (2012); Y A S 2, Primetime, Brooklyn, NY (2012); Knowledge of the True Games, Know More Games, Brooklyn, NY (2012); Vernalis, North Henry Annex, Brooklyn, NY (2011); Philadelphia Out of Phase, Bodega Gallery, Philadelphia, PA (2010); Horror Vaculi, Nudashank Gallery, Baltimore, MD (2010); and GIANT SALE, A.P.E. Gallery, Northampton, MA, (2009).